Looking to hit the water? We’ve got you covered. With approximately 3.6 million miles of streams — including 12,734 miles of Wild and Scenic Rivers — the United States has some incredible stretches of water. They’re the perfect place for a quiet float trip, a heart-pumping whitewater adventure or the chance to catch a big one. Whether it’s a day trip or overnight, below are some of the best river trips on America’s public waters to help you get started in your search for the perfect river adventure. Flow levels, weather and other factors can change the level of skill required to ply the waters or any other river segment. Check local conditions before venturing out. And for those who are unsure of their skills or who want to relax and let others do the planning, professional outfitters offer guided trips on many rivers. So fasten your life jackets, grab your paddle and #FindYourWay on one of these awesome river trips! Photo by Bob Wick, Bureau of Land Management. 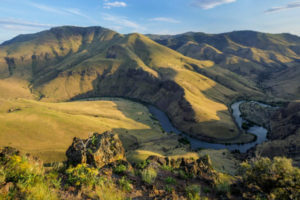 Located in central Oregon, the Deschutes Wild and Scenic River is a playground for outdoor recreation and a great place for your next whitewater trip. Thousands of people visit each year to enjoy its exciting whitewater, beautiful scenery and incredible fishing. 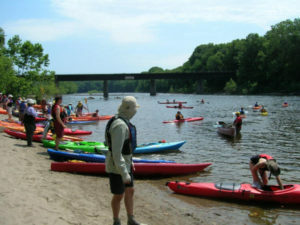 The river offers a variety of opportunities for both day and overnight trips. A trip on the river will take you through a rimrock-lined canyon that ranges from 900-2,600 feet in depth. Within this canyon, you will experience an incredible geologic and cultural history, and a diverse community of fish, wildlife and vegetation. Be sure to add it to your bucket list today! 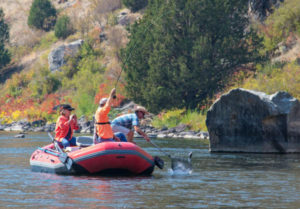 One of four sections that make up Montana’s Lee Metcalf Wilderness, Bear Trap Canyon Wilderness is an ideal spot for a fishing and boating trip. The 6,347-acre area offers beautiful wilderness scenery — plus exciting whitewater rafting featuring the famous Class IV – V “Kitchen Sink” rapid. The Madison River is one of Montana’s most coveted fly-fishing destinations, as it’s one of the most productive streams in Montana for brown trout, rainbow trout and mountain whitefish. As you travel the river and cast your line, be sure to look up. The 1,500-foot cliffs that border the canyon provide a breathtaking backdrop. Photo by Bureau of Land Management. For a great flatwater trip, head to Labyrinth Canyon on the lower Green River. An easy stretch suitable for canoes kayaks and rafts of all types, Labyrinth Canyon can be enjoyed spring through fall with the most popular times between Easter and Labor Day. 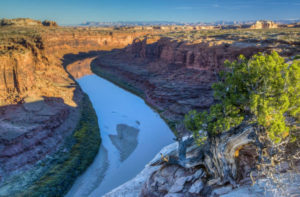 Here, you’ll float through Utah’s red-rock canyons, tracing the path of Major John Wesley Powell through 44 miles of this calm and scenic portion of the Green River. The Lab?y?r?i?nth Canyon section is perfect for a two-night trip, and if you want to float the longer stretch from Green River to Mineral Bottom, you can spend four days or more on the river. Word of warning: The area is remote and services and cell phone service are non-existent. You must be self-contained and self-reliant to deal with emergencies and plan to carry all your drinking water. And be sure to get a permit. Photo by Jeremy Matlock, Bureau of Land Management. Closely flanked by low, rolling hills with the Wrangell Mountains and Alaska Range in the background, the Gulkana Wild and Scenic River is perfect for those who are ready for an adventure. One of 208 river segments of the Wild and Scenic River system, the Gulkana offers excellent three to four day float trips through meandering waters with numerous riffles, and a short stretch of Class III rapids with convenient put-in and take out points at each end accessed from Alaska’s Richardson Highway. It is also one of the most popular sport fishing rivers in the state, providing rich habitat for rainbow trout, king and red salmon, and more. Along the way on your trip, you’ll see stunning views and a wide range of wildlife. There are more than 33 species of mammals and 59 species of birds known to live in the Gulkana River basin. 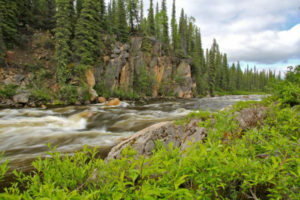 Although by Alaska standards, this river offers convenient access, it flows through roadless areas and visitors must be self-reliant. 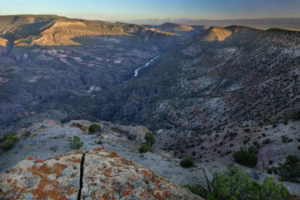 Just north of Montrose in west-central Colorado lies the Gunnison Gorge National Conservation Area, a diverse landscape ranging from adobe badlands to rugged pinyon and juniper-covered slopes. At the heart of it is the Gunnison Gorge Wilderness Area with a spectacular black granite and red sandstone double canyon formed by the crystal-clear waters of the Gunnison River. Anglers come for the gold-medal trout waters, while skilled rafters, kayakers and whitewater canoeists come for a true wilderness whitewater float through the 3,000 foot deep canyon. Every float begins with a mile-long hike into the gorge. Outfitters offer guide and packing services. Photo by Julia Bell, National Park Service. Flowing along the Pennsylvania and New Jersey border, the Delaware Wild and Scenic River is a spectacular spot for a day-long kayaking or canoeing trip with options to extend to an overnight trip. Divided in three sections (the Upper, Middle and Lower Delaware), the river takes you along a tour of the region’s diverse habitats and history. Sheer cliffs rise 400 feet above the river with a desert-like ecosystem on the southern-facing side and flora and fauna usually found only in arctic-alpine climates on north-facing cliffs. From an historic viewpoint, the river is one of the most significant corridors in the nation. The corridor contains buildings used during Washington’s famous crossing, historic navigation canals, Native American and colonial era archaeological sites and mills. Arguably the most challenging and spectacular fork of the American is the North Fork, with its emerald green waters and huge granite boulders. 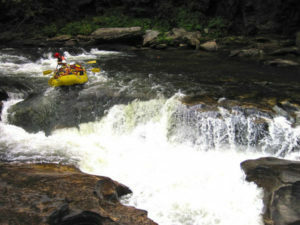 Best known for its thrilling class IV and V whitewater, it was designated as one of the nation’s Wild and Scenic Rivers. This awe-inspiring river canyon offers a remote exhilarating experience for those up to the challenge. Hikers and fishing enthusiasts can choose from a number of trails to access the river canyon, most of them dropping steeply from the canyon rim down to the water. Bring your gold pan and you are likely to find some color. Walls tower 2,000-4,000 feet above the river, creating a majestic backdrop for cascading waterfalls, brightly colored wildflowers and the bright, clear water of the river itself. Looking for a more sublime experience? 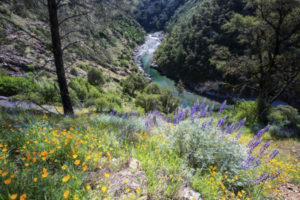 Head downstream where the American softens to a lazy stretch through an urban greenway — you won’t believe you are within the city limits of Sacramento as anglers cast for trout and salmon along cottonwood lined banks — or head up to the South Fork with its easy-access moderate rapids. This California gem truly offers something for everyone looking for an overnight trip. Mention Wyoming’s North Platte River to someone who’s fished there, and you’re guaranteed to get an earful of tales of the big browns, rainbows and cutthroats that they have fought on this legendary Wyoming stream. Even though they might not share their secret spots, this river offers plenty of public access points to the best fishing segments. The aptly named Miracle Mile and Grey Reef are just two popular segments — drift boats and shore anglers can both enjoy its waters. The numerous boat launches allow for a variety of trip lengths ranging from an hour or two to the entire day. The popular Bessemer Bend Recreation Site offers fishing, picnicking and interpretive displays discussing the significance of the site as a major crossing for the California, Oregon and Mormon Pioneer National Historic trails. Several public campgrounds are located along the corridor. 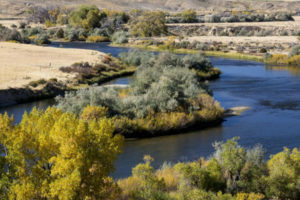 The North Platte is a true gem of central Wyoming, and a top destination in the state for a fishing and boating trip. Photo courtesy of Tim Palmer. Flowing through three states and the Ellicott Rock Wilderness, the Chattooga is recognized as one of the Southeast’s premier whitewater rivers. It begins in mountainous North Carolina as small rivulets, nourished by springs and abundant rainfall. High on the slopes of the Appalachian Mountains is the start of a 50-mile journey that ends at Lake Tugaloo between South Carolina and Georgia, dropping almost 1/2-mile in elevation. The Chattooga offers outstanding scenery, ranging from thundering falls and twisting rock-choked channels to narrow, cliff-enclosed deep pools. The setting is primitive — dense forests and undeveloped shorelines characterize the primitive nature of the area — so travelers have to rely on their own skills and strength. Check out more awesome river trips on America’s Wild and Scenic Rivers. This entry was posted in River Fishing, Where To Fish on June 8, 2018 by ronniegarrison. What Are Missouri Paddlefish and When Does Season Open? Editor’s Note: Here’s an interesting look at a sport many of us have never tried, but it’s apparently one of the few ways to harvest the giant “spoonbills” that populate many of our big Midwestern rivers and lakes. MDC makes paddlefish snagging possible through annual stockings of fingerlings. Missouri’s annual spring paddlefish snagging season is a popular pastime for thousands of anglers. The state’s major paddlefish snagging waters include Lake of the Ozarks, Truman Lake, and Table Rock Lake with the season running March 15 through April 30. The season for the Mississippi River is March 15 through May 15 with a fall season of Sept. 15 through Dec. 15. Also known as “spoonbills” because of the shape of their snouts, paddlefish take seven or eight years to grow to legal size. The fish feed on plankton and other microscopic prey. These filter feeders therefore do not take bait from hooks and must be snagged using large hooks that catch in the mouth, gills or other areas of their bodies. The success of paddlefish snagging is dependent on weather conditions, primarily water temperature and flow. The Missouri Department of Conservation (MDC) makes paddlefish snagging possible in the Show-Me State through annual stocking of up to 38,000 fingerlings raised at Blind Pony Hatchery near Sweet Springs. 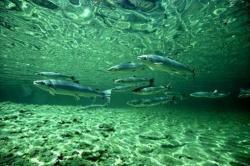 The fingerlings are released into Lake of the Ozarks, Truman Lake and Table Rock Lake, plus the Black River. The annual stocking is necessary because dams and other barriers to spawning areas have eliminated sustainable natural reproduction in the lakes. Yasger added that MDC released an especially large number of fingerlings into Lake of the Ozarks, Truman Lake, and Table Rock Lake in 2008. The more than 164,000 fingerlings released are now eight years old and should start providing good numbers of fish for snaggers to harvest. MDC is beginning its second year in a five-year tagging project to help monitor paddlefish numbers and improve species management. Department staff are placing metal jaw tags on up to 6,000 paddlefish netted in Lake of the Ozarks, Truman Lake, and Table Rock Lake and up to 1,000 netted from the Mississippi River. Yasger encourages all snaggers to help out by reporting tagged paddlefish and to NOT remove tags from undersized paddlefish. Report tags by calling MDC at 573-579-6825 with the information, or mail the information with the flattened tag to: Missouri Department of Conservation, 3815 East Jackson Blvd., Jackson, MO 63755. Learn more about the tagging project from MDC online at http://on.mo.gov/1VA1E6B. MDC biologists are also implanting ultrasonic transmitters in adult paddlefish at Truman Lake, Lake of the Ozarks, Table Rock Lake, and the Mississippi River to track their movements and gain other important information. MDC asks that all snaggers who harvest fish with a transmitter to report it by calling 573-579-6825 or by e-mailing Trish Yasger at Trish.Yasger@mdc.mo.gov. It is important to return transmitters so they can be implanted in other fish. Yasger reminds snaggers to help undersized snagged fish survive to grow larger. The state’s major paddlefish snagging waters include Lake of the Ozarks, Truman Lake, and Table Rock Lake with the season running March 15 through April 30. The season for the Mississippi River is March 15 through May 15 with a fall season of Sept. 15 through Dec. 15. Unless exempt, anglers must have a current fishing permit to snag or to operate a boat for snaggers. The daily limit is two paddlefish and snaggers must stop snagging after obtaining the daily limit on Lake of the Ozarks and Truman Lake and their tributaries, and the Osage River below Bagnell Dam. The minimum legal body length for paddlefish at Lake of the Ozarks, Truman Lake, Table Rock Lake, and their tributaries is 34 inches, measured from the eye to the fork of the tail. The minimum legal body length is 24 inches on the Osage River below Bagnell Dam and in other Missouri waters. All paddlefish under the legal minimum length must be returned to the water unharmed immediately after being caught. The Wildlife Code of Missouri requires the head, tail, and skin to remain attached to all paddlefish while on the water so paddlefish should not be cleaned until off of the water. Also, extracted paddlefish eggs may not be possessed while on waters of the state or adjacent banks and may not be transported. Paddlefish eggs may not be bought, sold or offered for sale. Additionally, paddlefish or their parts, including eggs, may not be used for bait. Learn more about Missouri’s official aquatic animal, regulations, snagging reports, and more at http://huntfish.mdc.mo.gov/fishing/species/paddlefish. This entry was posted in Conservation, Fishing Tackle, River Fishing on March 3, 2016 by ronniegarrison. Atlantic salmon are an iconic New England species. In addition to the ecosystem role these fish play, they have been an important indicator of economic health in our region. Atlantic salmon once supported lucrative commercial and recreational fisheries, as well as the small bait shops, gear stores, and amenities for fishermen that contributed to the economy. Before this, Atlantic salmon were important to Native American tribes for historical and cultural reasons. Tribes relied on watersheds and their natural abundance of sea-run fish, including Atlantic salmon, for physical and spiritual sustenance. In the 1900s Atlantic salmon from Maine were so highly valued that for more than 80 years, the first one caught in the Penobscot River each spring was presented to the U.S. President. The last Presidential salmon was caught in May 1992 by Claude Westfall, who presented a 9.5 pound Atlantic salmon to President George H.W. Bush. Westfall’s was the last presidential salmon because there are now too few adult salmon to sacrifice one even for the President. Because of significant declines in returning Atlantic salmon, the Atlantic salmon commercial fishery closed in 1948, and the recreational fishery closed in all Maine waters in 2008. In 2000, NOAA Fisheries and the U.S. Fish and Wildlife Service listed Gulf of Maine Atlantic salmon as “endangered” under the Endangered Species Act. The fish, which were historically native to almost every river north of the Hudson, had only remnant wild populations in 11 rivers, all of them in Maine. In the 15 years since their 2000 listing, Gulf of Maine Atlantic salmon have not shown signs of improvement. To draw attention to this iconic species and our plan for saving it from extinction, NOAA Fisheries recently launched the “Species in the Spotlight—Survive to Thrive” initiative. Atlantic salmon are one of the eight highly at-risk species in the nation that we have identified as needing special attention. These endangered species have declining populations, but also have a high probability of survival if we can marshal the resources to turn their trajectories around. As part of the Species in the Spotlight initiative, we developed a five-year roadmap to aid the recovery of Atlantic salmon. The plan, which will be released in early 2016, outlines specific actions to save this species and will involve our regional partners in conservation. The primary focus of the plan is to restore access and quality to river habitat in Maine and work to better understand and address threats in the marine environment. Atlantic salmon are anadromous fish which means they spend a portion of their lives in freshwater and a portion in the ocean. Anadromous fish are indicators that the links between freshwater, estuarine, and marine ecosystems are clean and well-connected. The connections within the ecosystem are so strong that many of the factors that are impacting salmon’s survival are also affecting other species such as American shad, alewives and even some marine fish stocks such as Atlantic cod. Healthy anadromous fish populations support important marine food webs, providing a forage base for commercially important species like striped bass, cod, and haddock. When river systems are blocked or are too polluted to support these fish populations, the effects are felt throughout the entire ecosystem. 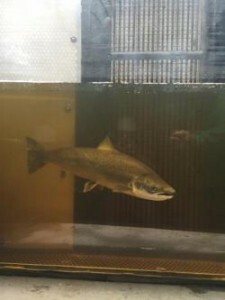 The return of Atlantic salmon, along with other anadromous fish, would indicate the return of a healthy and connected system. “The principal decline in the New England salmon fishery considerably antedated 1880, however, and was coincident with the erection of dams or other barriers to the passage of fish” – C. Atkins (1894). One complicating factor for Atlantic salmon is that they are anadromous fish. When they return from the seas between Northeastern Canada and Greenland to the rivers to spawn, hundreds of dams block or impair their ability to reach the critical freshwater habitats that are still capable of supporting spawning. As noted in the quote above, this problem was created over many, many years and so, it will take time to restore connectivity for this species. Listing Atlantic salmon as endangered in 2000, and expanding the listing to include large rivers like the Penobscot and Kennebec in 2009, helped spur 35 fishway constructions and dam removal projects in Maine, including the removal of two major hydroelectic dams (Great Works and Veazie) as part of the Penobscot River Restoration Project. Since the Penobscot River is home to roughly 75 percent of the adult Atlantic salmon returns in the U.S., restoring access to this river is particularly important. In the Penobscot River basin alone, there are still more than 130 dams that block or impede access to approximately 90 percent of salmon’s historic spawning and nursery habitat. There is still much work to be done. Dam removals can bring back fish to habitat that was previously inaccessible. After the removals of the Fort Halifax Dam (2008) and the Edwards Dam (1999) on the Kennebec River, alewife and blueback herring (collectively called river herring) returns increased from less than 100,000 in 2006 to more than 2,150,000 in 2015. Similarly, on the Penobscot River, after the Great Works (2012) and Veazie (2013) Dam removals, along with improved passage at other upstream dams, documented returns of river herring increased from 2,000 in 2011 to an estimated 585,000 in 2015. Roughly 1,800 American shad passed the Milford Dam (now the first dam on the Penobscot River) for the first time in 100 years. Additionally, in Fall 2015, researchers found three endangered shortnose sturgeon in habitat upstream of the Veazie Dam remnants for the first time in a century. In 2015, biologists counted 731 Atlantic salmon at the Milford fish lift. (See map of Penobscot River Restoration Project). Our five-year action plan outlines specific actions to stop the decline of this species and put it on a path towards recovery, including restoration of the ecological connections between the freshwater and marine environment and restoration of habitat quality. Among the pieces of the plan are to: review hydroelectric power plant dams up for licensing to ensure that they have effective fish passage; encourage removal of dams and other barriers to fish passage where possible; work with other countries to limit Atlantic salmon catch in the ocean; and, continue research and monitoring of Atlantic salmon. You can help by encouraging or participating in programs to conserve and restore land and water resources that benefit migratory fish and promote abundant, suitable and accessible habitats for Atlantic salmon. This can include working with communities to remove or provide passage around blockages such as round culverts or dams that block or impair movement of Atlantic salmon, maintaining forested riparian areas around rivers and streams, and implementing land use practices that protect streams from pollution and excessive erosion. For more information on this initiative and what you can do to help Atlantic salmon, please contact Kim Damon-Randall, Assistant Regional Administrator for Protected Resources at Kimberly.Damon-Randall@noaa.gov. This entry was posted in Conservation, River Fishing, Trout and Salmon on February 4, 2016 by ronniegarrison. Catching bass in the Altamaha River basin in Georgia offers a lot of different kinds of fishing. Some waters just seem to produce better bass fishing. The Ocmulgee River, whose waters produced the world record bass, and the Oconee River join to form the Altamaha River. The lakes on the two rivers upstream are varied but excellent bass fishing waters, and the big river downstream of the junction is full of hungry bass. On the upper end of the basin, Lake Jackson on the very upper end of the Ocmulgee and Lakes Sinclair and Oconee on the Oconee River are popular destinations for bass fishing. Although there are some similarities, all three lakes have their own types of cover and structure. The Altamaha River itself can be intimidating if you don’t fish big rivers much but it can be excellent if you take the time to learn to fish it. It is very different from the lakes but all four places are definitely worth fishing right now. Jackson, dammed in 1911, is one of our oldest lakes and it covers 4750 acres. The dam is on the Ocmulgee River downstream of where it forms at the junction of the South, Yellow and Alcovy Rivers. Its rocky shorelines are covered with docks and the lake has a reputation for big largemouth, but it is also full of spotted bass. Kip Carter is a well known professional bass fisherman and Jackson is his home lake since grew up on it and lives nearby now. He knows it well and this time of year is one of his favorites to fish it. Bass fishing on Jackson in the spring centers on both the bass and shad spawn. Bass will move into spawning areas in waves, starting in March and continuing through April. Since the bass don’t all spawn at one time you can catch pre spawn, post spawn and spawning bass right now. Kip says you can find bass on the bed almost any day in April. The shad spawn in April provides some of the best fishing of the year. When the shad move to seawalls and riprap to spawn the bass concentrate on them, eating their fill every day. They are so voracious they will often eat until you can see the tails of the last shad they swallowed sticking out of their throat. A wide variety of baits will catch bass now on Jackson. While the shad are spawning a white buzz bait or white spinnerbait with silver blades is definitely a go-to bait. Use a one quarter ounce bait for most fishing, but go to a half ounce spinnerbait if you want to concentrate on bigger bass. Early in the morning you will see the shad schools running the seawalls and riprap. Points on the main lake are best, especially if the channel swings in by them, but secondary points back in the coves are also good. You should move fast until you find the shad spawning then slow down. Throw your bait right on the bank and work it out at a 45 degree or less angle. The bass will be right on the bank early. After the sun gets on the water back off and slow roll your spinnerbait, covering deeper water where the bass are holding after the shad back off the bank. Also try a jerk bait after the sun comes up. Cast near the bank and work it back in a jerk – jerk – pause action, making it look like an injured shad trying to get back to the school. Shad colors work best. During the day Kip targets shallow cover lake brush piles, blowdowns and docks in the coves. A brown jig with a brown or pumpkinseed trailer is one of the best baits to fish around this cover and a three eights to one quarter ounce jig will fall slowly and not get hung as much. It will also draw strikes from any bass on the bed you spot. A weightless worm will get bit better than just about any other bait, day to day, this time of year. Kip sticks with natural colors rather than the bright worms some favor and watches his line for the bites rather than just watching the bait. He says the natural colors will draw more strikes than the brighter colors. If you like worm fishing both a Carolina or jig head worm will catch fish. And they are better for fishing a little deeper. Try a Baby Brush Hog on the Carolina rig and a straight worm like a Trick worm on the jig head. Stick with natural colors like green pumpkin and fish rocky points and creek channel drops with them. Lake Oconee is on the upper Oconee River just south of I-20 and is one of our newest lakes. It has it everything bass like with defined channels, deep points, riprap, docks, roadbeds, grass beds and standing timber. With a slot limit protecting 11 to 14 inch long bass it produces a lot of them that size that are fun to catch. It also means there are a lot of bass longer than 14 inches in the lake. 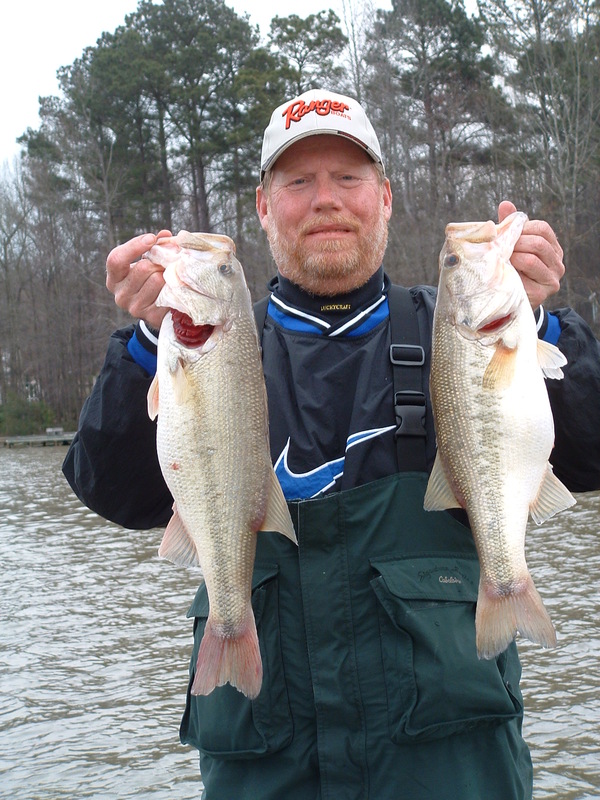 Roger McKee guides on Oconee and does well in a lot of tournaments there. 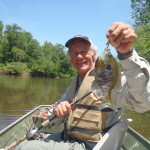 He says the bite centers around the bass spawning movement and the shad spawn on Oconee like it does on Jackson. 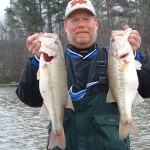 A spinnerbait and crankbait are good baits to locate the bass on Oconee and also catch the bigger bass needed in tournaments. Roger will fish both baits fast, looking for active fish. He says he would choose a crankbait if he could use only one bait on Oconee right now. Use white spinnerbaits with a gold and silver blade in clear water but go to more chartreuse in the bait as it gets more stained. Shad colored crankbaits are better in clear water but also use more chartreuse baits in stained to muddy water. Many big bass spawn on Oconee in March so they are on an active feeding spree now, and there will also be pre spawn bass moving in as well as bass on the beds. Secondary points in the coves and smaller creeks are the key to both pre and post spawn bass and Roger will hit as many as he can. By fishing his crankbait or spinnerbait fast he can cover a lot of water, and fast moving baits make it harder for a bass to see it is a fake and will draw reaction strikes. The very back of the cuts and pockets behind these secondary points are where the bass spawn, so look to them for big females on the bed. Roger says some of the biggest bass of the year can be caught off the beds if you have the patients to soak a jig and pig or worm in them. A weightless worm will also catch fish back in the pockets now. Fish it around any cover like stumps, brush, blowdowns and grass. Try working it fast just under the surface first but it you don’t get hit slow it down. Jerk it and make it dart, then let it sink. Watch your line and if you see any tick or movement set the hook. Roger also fishes a jig and pig and Carolina rig on Oconee. The Carolina rig is good on the secondary points, especially if you get a couple of bites on fast moving spinnerbaits or crankbaits on one. Slow down and work it with a worm on a Carolina rig. Fish the jig and pig on the same points, but also throw it around brush, blowdowns and stumps. Fish a brown jig and trailer in clear water but go to a black and blue jig and trailer in stained water. Work the bait slowly with hops on the points and jiggle it on wood cover. During the shad spawn all the bass on the lake, unless they are locked in on the bed, will feed on them. Shad prefer hard cover like riprap and seawalls to lay their eggs seawalls with riprap are all over the lake. Fish your spinnerbait fast on them early in the morning close to the rocks then slow it down some as the sun comes up. Lake Sinclair backs up to the Oconee Dam but varies a good bit from it since it is an older lake. Many coves have grass like water willow in them and the docks tend to be older and have more brush piles around them. There is no slot limit on bass and Sinclair bass tend to run smaller, with lots of 11 to 13 inch bass being caught every day. Both my bass clubs fish Sinclair this time of year since we catch so many bass there and there are so many different patterns you can fish. The bass spawn is in full swing and the shad spawn will take place during the month. When the shad are not spawning, start early in the mornings with a white and chartreuse buzzbait or spinnerbait back in the coves around the grass. These grass beds are full of bluegill and bass love to eat them. If the grass is not too thick throw to the back side of it and work your bait out. If it is thick cast into it as far as you can without getting your bait clogged up. Keep the buzzbait moving steadily but drop the spinnerbait at the edge of the grass in any holes or cuts. Let it flutter down a few inches then pull it forward. Bass will often eat it as it stops and flutters. Floating worms are also good in the grass. Fish them in the grass, letting the bait fall into any holes and at the edge. A white Trick worm is good since you can see it and keep track of where it is and when it disappears, set the hook. After the sun gets up back off to secondary points and fish a three sixteenths ounce jig head with a green pumpkin worm on it. Drag it along the bottom, with a hop a few inches high every foot or so. Some JJ’s Magic chartreuse dye on the tail mimics the fins of a bluegill and helps you get more hits. During the shad spawn fish a three sixteenths ounce white spinnerbait with two silver willowleaf blades on riprap, seawalls and around the grass, too. Shad will spawn on the grass as well as the wood and rocks. Watch for flickers of shad as the school moves down the bank. Cast as shallow as you can, even to the point of landing your bait on the bank and pulling it off. It often seems a bass will sit with his nose right on the rocks, waiting on a shad to come by. You don’t want to cast behind them. After the sun gets on the water and the shad quit moving, back off the cover and reel the same spinnerbait slowly, keeping it right over the bottom. Fish it out to at least eight feet of water since bass will back off to that depth after feeding. Docks are also hold a lot of bass this time of year and you can catch them by running a shad colored crankbait or your spinnerbait beside the posts and over brush piles around them. Also pitch a black and blue jig and pig to the docks, getting back under them as far as you can when the sun is bright. Try to bring your jig and pig right beside every post. When you hit brush stop your bait and jiggle it in one place to get a reluctant bass to eat it. Make it look like an easy meal for a lazy bass. The Altamaha River starts south of Vidalia where the Omulgee and Oconee Rivers join. It is a big river with lots of current but also has many pockets and backwaters with overhanging trees and bushes. These pockets are where the bass move in the spring to spawn, so that is where you want to fish. This is pretty simple fishing since you will be casting to visible cover in shallow water. One of the best tactics is to skip a weightless worm under overhanging limbs of willow trees. Let it sink to the bottom and settle for a few seconds. Watch for your line to start moving off when a bass picks it up. Use natural colored worms like green pumpkin or black. Also study the backout. If it is a small creek entering the river it will often have a channel the bass will follow. Target stumps and other wood cover along the channel with a chartreuse and white spinnerbait with one gold and one silver willowleaf blade. Run the bait over the wood then let it fall as it passes. If the backout is an old oxbow, usually one side will be deeper. Bass often hold on this deeper side on wood and grass. A spinnerbait fish beside the cover is good but also try a black and blue jig and pig flipped into the heaviest cover on this deeper bank. 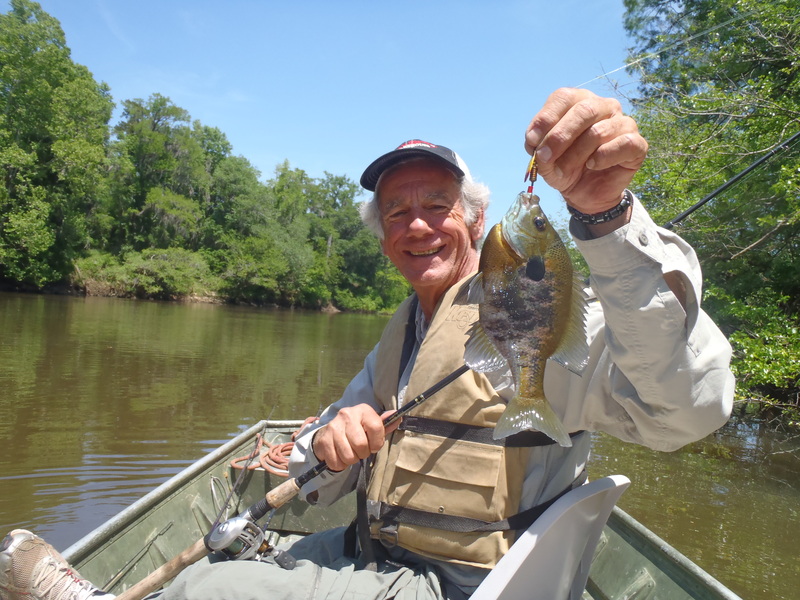 The Altamaha River drainage offers lots of different fishing opportunities. Give them all a try. This entry was posted in Bass Fishing, How To Fish, River Fishing on June 22, 2013 by ronniegarrison.